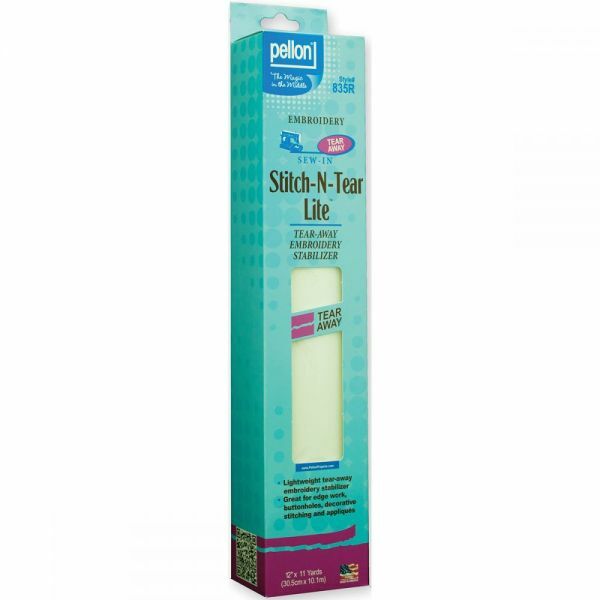 Stitch-N-Tear Lite Tear Away Embroidery Stabilizer - PELLON: Stick-N-Tear Lite Embroidery Stabilizer. This light-weight tear-away stabilizer is great for edge work, buttonholes, decorative stitching, and appliques. It adds body and support during machine stitching and embroidery and features an easy to use application. Upon completion of the design, tear away any excess stabilizer. Stick-N-Tear Lite tears away cleanly without distorting stitching. This package contains 11 yards of 12-inch-wide stabilizer. 70% polyester, 30% cellulose. Acid free. Made in USA.